Data literacy has a vital role to play in developing government policy and in delivering services that meet the needs of people across the UK. GDS’s Data Group has a team of data scientists, part of a growing cross-government community, using these new techniques to bring new insights to address complex challenges and improve delivery. However, if we are to get data science to become part of the everyday toolkit of government we need to ensure that the opportunities of using these techniques are understood and taken up by those outside of the data scientist community. Therefore, we’re also undertaking work to help those who aren’t data scientists in government make the most of the opportunities that these new techniques have for the delivery of their services and the development of policy. As ever we’re starting with a discovery phase to understand the breadth of potential users, what they need to know about data science, and how they want to receive this information. This will help us to make sure that any products we develop are based on real user needs of people in government. At the same time we’ll pull together potential content based on the work of data science specialists both here and across government. We want to identify the areas they believe will be most helpful to colleagues from different working backgrounds. By hearing from them and understanding how they use data science, we can start to plan our approach beyond specialist groups and into wider government. The data science community globally already produces a huge range of blogs, online courses, and other resources where they share their knowledge and help each other improve their skills. However, many of these are targeted at specialist users or people looking to become data scientists. We want to also include people who work with data scientists, or who have a high-level understanding of the opportunities presented by these new technologies. We want to build much broader understanding of data science. We want to do this by using an open and community-based approach - providing ways of accessing knowledge and resources that have been created elsewhere. We also want to encourage those who aren’t so familiar with data science to incorporate the techniques into their work. At the moment we’re open about the form of the final product, and the user research will help us get closer to understanding what might work best - it could be a digital service, in person training or something else. We will blog more about our findings from this discovery stage in the next couple of months. In the meantime, if you have any examples of good practice, products or resources please do flag them to us: we’d be very keen to hear from you. The Open University / FutureLearn MOOC "Learn to Code for Data Analysis" uses the context of open data to motivate a short 4 week course on learning to code using the Python pandas data analysis library. The course also demonstrates the use of Juptyer notebooks as a medium for writing reproducible, "literate" data analysis scripts. Interesting article - the importance of data literacy cannot be ignored. At the Open University we are investigating how to teach data literacy to young learners. We have shown that many concepts required to build data literacy can be taught, using real data sets, from a young age. We hope that future school leavers will have a new set of core competences for working with data and using it in real-world scenarios rather than just as abstract statistics and mathematics. We are also trialling approaches to support older 'informal' learners to engage in a more hands on way with data to support acquiring core data literacy skill of framing questions from data and using questions to select appropriate data. As you say, it is not about building a nation of data scientists but in engendering a sense of familiarity with data such that it can become a useful tool that people can use in their work and also in other areas of life. Thanks Annika for the comment. I'm sure there will no doubt be similarities at any age in terms of the approaches which help people get more used to working with data. I'd be interested to find out more about your research at the OU - my email address is in the final hyperlink in the blog if you'd like to email me. Annika - fully agree with you. There seems to be a lot of overlap between the work you are doing at the Open University and our work at Tuva. From our work so far to bring Tuva's Data Literacy Solutions to schools, higher education institutions, businesses, and sustainable development organizations, we have learned that there is a vast array of knowledge, skills, and competencies that are essential for data novices to "become data literate" and have a strong foundation in data, statistics, and analytical thinking. If people in government are to obtain a stronger understanding of the power (and need) of data to drive better decisions related to programs and policy, we believe they would need to have strong understanding of data and statistics (built on use of authentic, relevant data), and how a variety of data analysis techniques can help them answer questions and address their needs in their local contexts. In general, we have found that a large percentage of the materials that exists out there today is fairly generic in nature. Although many resources make for good reading, very few products or services actually enable this audience to truly dig deeper into how data can have an impact in their work and how it has the potential to drive better decisions for their constituency. Hi Martin - Sounds like you're quite far ahead already in DCLG and that there would be some good insights for us. Can we come over and talk to you about what you've been doing? Last year at DCLG I used “Code Club” to develop much needed data skills across the department. Teams of people worked on pilot projects (as part of their L&D days) in a competition running for a couple of months. We provided support events and workshops targeted to support implementation of the pilot projects. 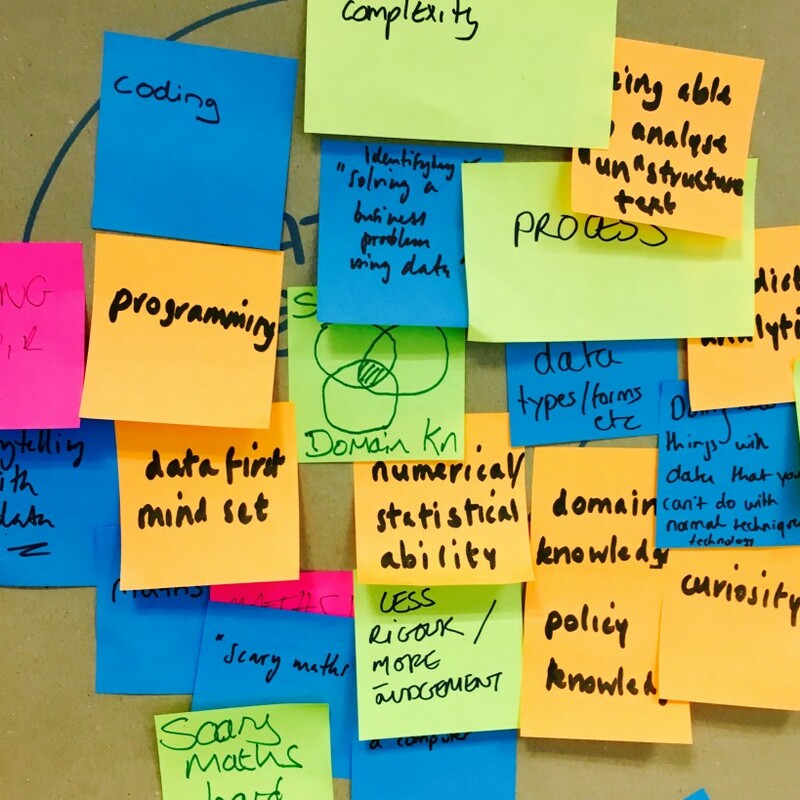 We’re now refining the approach to deliver a more strategic way of building a broad set of data skills and capability across the department and identifying suitable data science projects. Participants are learning about coding, ethics, scraping, API’s, researching data sources and broadening their data skills and they’re all relevant to departmental objectives. All of the participants are incredibly enthusiastic.